Technology helps us achieve our mission to “equip students for service in God’s world” by integrating academic excellence with a distinctly Christian perspective. 1:1 Computer access encourages independent learning at the student’s own pace and develops critical thinking and problem-solving skills. Computers offer unique ways of learning which motivates students to eagerly participate. Laptops that can be taken home provide seamless continuity on projects, homework, collaboration, and communication between teachers and students. Our society has become increasingly dependent on technology. Computers are not a supplemental part, but an integral part of society and of the educational process. For assignments and projects involving technology, all students should have equal access to equipment at home as well as at school. 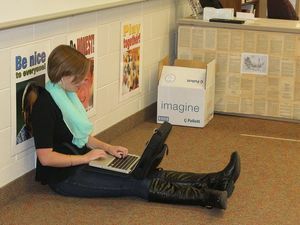 Computers allow for anonymous questioning from timid students, and provides them with a safe avenue of inquiry. Computers enable teachers to instantly assess a class’s grasp of new concepts/information. The internet provides virtually unlimited, constantly updated, and in most cases, free resources, more extensive and more up-to-date information than aging textbooks can provide, and at a lower cost. Technology skills are crucial for future higher education and employment. Whether high school, college or beyond, skills and values taught at ACS provide an excellent foundation for the future of every student. Our children are already using technology. As a Christian school, ACS is uniquely equipped to assist students to exercise Christian discernment and appropriate use of technology in the academic and social setting. We are sensitive to the need for security when using the Internet, and safeguards have been built into our planning and delivery of this service.